Kofax in Insurance: applying capture driven processing to drive customer responsiveness and gain distinct competitive advantage in your core business functions. Support of multiple languages. High automatic classification and validation rate. Scalable and expandable enterprise capture platform. End-to-end processing and seamless integration into SAP. Outstanding classification and validation quality; self-learning technology saves times and development efforts. “Productized proven solution”. (Real-time) integration capability with Oracle and multiple repositories. One platform to handle all types of documents – paper, fax, email and attachments. Self-learning technology. Supporting any process; adding processes without additional cost. 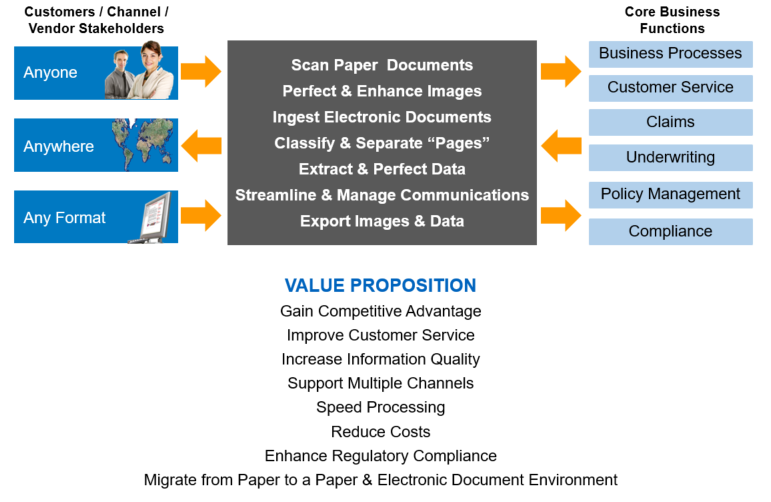 Best solution for handing unstructured documents (KTM performance proven in POC). Improve Top Line Results. Accelerate business critical processes (claims, customer service, policies, contracts…); Shorten sales cycles; Make customer communication cost effective. Increase Operational Efficiency. Improve data accuracy; Enable straight through processing; Standardize data input and flow, enabling fast information exchange across multiple processes; Bridge information gaps. Reduce Costs Across the Enterprise. 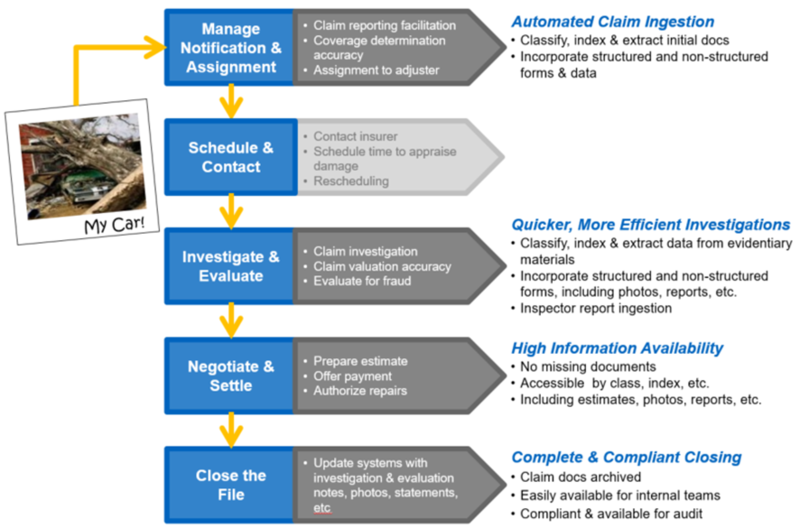 Eliminate manual work from claims and other processes; Exchange information across processes and eliminate cost and risk of fraud, double payments, etc. Information arrives in many different forms. In order to be processed someone needs to understand what it is. Then they need to decide what to do with it. Only then can they assign it to the relevant system of process. This is nearly always a manual effort. Manual processing in fraught with the potential for errors. Exceptions take longer and maybe overlooked. Manual processing takes time – minutes, hours, days. When Kofax enters the equation the time taken to process information is either totally eliminated or significantly reduced. Kofax enables touchless processing of information. Data is captured from the information, validated and used to automatically inject the information into the right system and step in the business process – regardless of channel. No manual intervention results in significant cost saving and faster processing. For information requiring manual review, the time taken to understand and decide is still significantly reduced. Information is processed and presented to the right people and systems – and can be leveraged across functions (claims, underwriting, customer service, policy management, fraud, accounting, etc.). Cost saving and productivity increases accrue quickly even for information requiring some human processing. Streamlined risk, fraud and compliance management. By digitally capturing the key documentation in 2-3 seconds, the information is readily – and accurately - available for distribution to the relevant back office system. Additionally, the document is time- and date-stamped, enabling a full audit trail for compliance purposes. Missing documentation can be highlighted for the agents concerned with the customer still engaged, thus saving time and increasing customer satisfaction. We offer a flexible, modular solution which is easy to integrate into existing infrastructures. System operation is no more complex than scanning and printing thereby minimizing additional staff training. Expand adoption of underwriting tools into new lines of business. Contact us for more information regarding Kofax Insurance Claims Processing.